Bryan Singer returns to a world that isn’t inhabited with superheroes, joining an old friend in screenwriter Christopher McQuarrie, a partnership that last resulted in The Usual Suspects. The question then becomes whether lightning can strike twice and if Tom Cruise’s thoughts that it would, by producing it as his second feature as head of United Artists, could be correct. With Valkyrie, a “based on true events” tale of high Nazi officials with enough guts to risk their lives to stop Adolf Hitler’s reign of terror and his sullying of Germany’s good name, those questions will be answered. If I were to be bold enough to weigh in with my opinion I’d say all those involved should feel proud of their work. I won’t say lightning struck again because, honestly, I was never that impressed by The Usual Suspects, it’s good, but without the ending it wouldn’t necessarily even approach great. Much are my thoughts on this historical wartime opus—it tells a very intriguing story with the right amounts of action, espionage, and heroism, however, I don’t see it as anything spectacular. It’s a very well done film and it can be applauded for that fact. Cruise’s first foray into the producing world with his newly purchased studio was a little film with a big time cast, Lions for Lambs. It was a small-scale tale that hit home more often than not, a gamble that risked finding an audience and I believe succeeded. Valkyrie, on the other hand, was set up to be the studio’s tent-pole attraction, announcing the return of a movie-house. Unfortunately, after being pushed back a complete year, the release has become somewhat lackluster, a huge albatross of whether the backers didn’t feel it would succeed then making us wonder if it will now. With some big names attached behind and in front of the camera, many believed this would be a contender for end of year awards. I don’t think that will be the case. Solid yet unspectacular creates a piece that is worth seeing and recommending, but not an award-winning masterpiece. Singer does do a lot right, though, hopefully showing that he can branch out and distance himself from X-Men and Superman Returns to bring the humanity and character evolution that worked so well with his two mutant stories into a world grounded in reality. At the end of the day, this film is made to showcase the actors while trying to educate the public about these superheroes in their own way, some heroics from a country and time that saw only murder and hatred. While this fact is what I enjoyed about it, it is also what may cause some of its lackluster sheen. Knowing, (I hope I’m ruining nothing here and people realize that Hitler committed suicide when the Allies surrounded Berlin), that the attempt to kill and overthrow the Nazi regime fails, makes the first half exposition drag. One wants to see how the plan falls apart, not how it was shaped and put into motion. Let me correct myself, you do want to know these details, how these men banded together, how they duped Der Führer, it’s just the anticipation to watch the plan go into effect that dulls the factual history from being as interesting as it should be. Once the day finally arrives to prove their worth, the tension and pace tighten up and drive steadily to the end, keeping you riveted as each step advances. I understand what Singer is trying to do by showing Colonel von Stauffenberg’s family and his not following orders—for the right reasons—ending in the loss of appendages and an eye, but was it all truly needed? Why can we understand the pain and necessity for people like General Olbricht, doing what he is doing, by looking at his loved ones in photos, yet we need Stauffenberg’s to be front and center, even getting an actress like Carice van Houten to portray his wife? I won’t go into detail about the plans, which are the beauty of the operation; the ideas and execution of them are what keeps your interest. It is a pretty airtight mission, but as General Beck states, it’s a military operation, they never go right. No one can ever anticipate what might happen—venue changes, a person’s kindness to help carry something, the brief second-guessing of a man sacrificing precious seconds. One can never practice anything to perfection because life just isn’t that exact. But therein lies the heart of this story, that there are people who dare to stand against the norm to fight for what is right. Despite their oath to Hitler, these men and women put their feet down and risk it all for the citizens, for their country. It was never about them, it was always about Germany. The one thing I feared was the fact that everyone spoke with their natural accents, no one made anyone attempt a horrid German tongue to possibly distract and distance us from the reality. While there is something to be said about realism, if handled right, there can be exceptions. Bryan Singer deftly maneuvers his way into the English translation by beginning in German and slowing superimposing our language atop the vocal track. It’s a subtle trick that helps make us believe we have been brought into a state of translation; the characters are speaking German yet we can understand them. This also helps in allowing the actors to give it their all, without the clunky self-consciousness that follows speaking out of one’s native speech patterns. I believe Tom Cruise does a wonderfully solid job as von Stauffenberg and the rest of the cast follows suit. Tom Wilkinson and Terence Stamp show that they can pull out some nice performances despite the occasional paycheck they take on other horrific career choices, and guys like Eddie Izzard and Thomas Kretschmann can excel in smaller roles, enhancing the bravado of the others. The two that impressed me most, however, were Christian Berkel as von Quirnheim and Bill Nighy’s Olbricht. Nighy exudes the inner conflict and struggle of humanity throughout the film, questioning everything and wanting to be absolutely sure of each step. When the time was right, though, he was able to compose himself and do his job, because deep down he knew he was doing what he believed in. Kudos to all involved for making this story and opening my eyes to it, as I’m sure it will for many others too. Everyone brings their A-game, it’s all just too much a non-fiction film for me, stating the facts without surprise, lecturing rather than digging into our souls and touching us. The ending is magnificent, don’t get me wrong, it shows the strength of character these “traitors” had and it instills a legacy of heroism that they deserve. The journey to that point may be a little too paint-by-numbers for my liking. 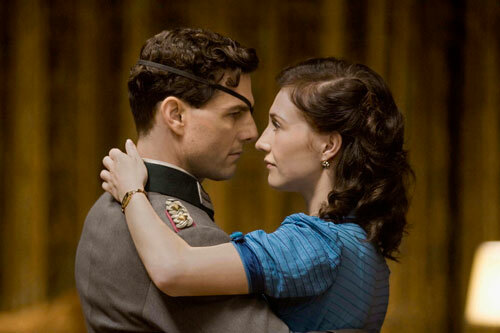 TOM CRUISE stars as Claus von Stauffenberg and CARICE VAN HOUTEN as his wife, Nina, in the suspense thriller VALKYRIE. VALKYRIE opens in theatres nationwide on December 25, 2008. © 2008 United Artists Production Finance, LLC. All rights reserved. 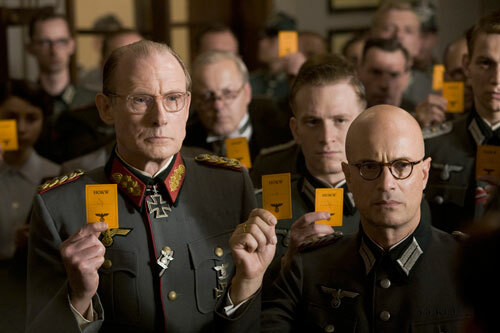 BILL NIGHY (left) as Friedrich Olbricht, JAMIE PARKER (center back) as Werner von Haeften and CHRISTIAN BERKEL as Mertz von Quirheim in the suspense thriller VALKYRIE. VALKYRIE opens in theatres nationwide on DEcember 25, 2008. © 2008 United Artists Production Finance, LLC. All rights reserved.